A 90-minute power outage Wednesday night at Reagan International Airport occurred after redundancy built into the power system failed, according to a spokesman for Dominion, the utility that serves the Washington, DC-area airport. Two utility feeds power the airport, and both went down, said Charles Penn, spokesman. Beyond that, the utility continues to investigate exactly what went wrong with the underground equipment. Travelers in the Reagan airport began tweeting around 9:30 pm EST that the airport had been plunged into darkness. The utility had restored power by 11 pm. Electric reliability in airports has come under increased scrutiny since the Hartsfield-Jackson Atlanta International Airport lost power for 11 hours in December, canceling flights and costing Delta Airlines $40 million. Atlanta’s airport, too, had a redundant feed — meant to ensure reliability if a primary feed fails — but it succumbed to fire in an underground tunnel. The prolonged outage in Atlanta — and its cost — has heightened interest in airport microgrids, especially since conventional back-up generators can have a significant lag in response. Back-up generators also sometimes do not start up when called upon. Microgrids, by contrast, run all the time so there are no surprises when back-up power is suddenly needed. Several airport microgrid projects are now in development. The Allegheny County Airport Authority received 64 responses in March to its request for expressions of interest seeking a developer to design, build, own and operate a microgrid at the Pittsburgh International Airport. 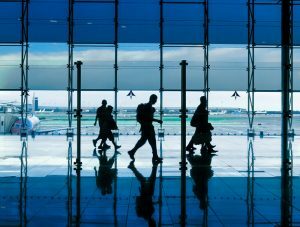 The authority is looking at making use of a microgrid to serve not only the airport, but also the growing roster of businesses that operate there. The airport microgrid is in keeping with a larger pursuit of distributed energy to modernize the city. The Chattanooga Electric Power Board (EPB), and partners are working on a microgrid for the Chattanooga Airport that will employ an innovative, open-source controller. The California Energy Commission in June approved $5 million for the Humboldt State University Sponsored Programs Foundation, which has been developing a community-scale renewable energy microgrid at the Redwood Coast-Humboldt County Airport. The San Diego Airport already has a microgrid, which it says has not only improved its reliability, but also reduced its energy costs. The airport microgrid is designed as a continuous loop so that if one part of the facility goes down, power is rerouted from another part of the loop. Track news about airport microgrid projects. Subscribe to the free Microgrid Knowledge newsletter. Perhaps the question that needs to be asked is why there was not a backup diesel genset (or a more prime power system that includes CHP) for that portion of the airport that was impacted. Cost (capital and O&M) versus benefit, and hard to quantify benefit for one outage in how long of a time? I visited one of Europe’s major airports electrical areas. They had onsite gensets and double redundancy feeders with huge banks of batteries. Their logic was that no matter what happens on the grid, they need to stay operating at least long enough to land any planes coming from over the Atlantic. I would guess / hope that Dulles and other major airports also have such set-ups.